Our physician and skin therapist are considered experts in their field, and we are one of the few practices where our doctor performs all Botox® injections. BOTOX Cosmetic is also used by Dr Lorraine Smith to treat migraine headaches, tooth grinding, and excess sweating. Neuromodulators work by temporarily blocking nerve pulses in facial muscles. They are used to safely, simply and effectively improve the appearance of frown lines, forehead creases and crow’s feet. They are often effective in areas where fillers may not be. At Vital Face and Vein, we use only New Zealand Ministry of Health fully registered and approved neuromodulator injectable treatments such as Botox & Dysport. These areas eventually begin to wrinkle from years of smiling, frowning, squinting and excessive muscle movement. By providing our patients with neuromodulators, we are able to relax the underlying muscles and reduce the appearance of wrinkles. A Botox® wrinkle treatment is generally pain free, but some patients experience a slight tingling sensation or soreness in the injected area for a brief period of time. However, if the patient requires, a topical anesthetic may be applied before the procedure to minimise discomfort. Some patients like ice before injections but others find this causes an ‘ice-cream’ headache so we do not routinely use ice. HOW MUCH RECOVERY TIME IS NEEDED AFTER INJECTIONS? None, you can return to your daily activities and apply makeup immediately following the treatment. Many patients receive BOTOX Cosmetic injections in their lunch hour and return to work. Botox is truly a lunchtime procedure. HOW MANY WRINKLE TREATMENTS ARE RECOMMENDED FOR OPTIMAL RESULTS? Usually only one wrinkle treatment is necessary. Once the injections wear off (3-4 months), it is safe to come back for another round of injections. You will see the full results of your Botox wrinkle treatment within a week. The effects of BOTOX Cosmetic begin between 24-72 hours and the effect lasts an average of 3 months. There is some evidence that after several repeated injections,the effects last longer. We frequently combine filler treatments and peels with Botox as it helps to smooth the areas to be treated and give superior results. 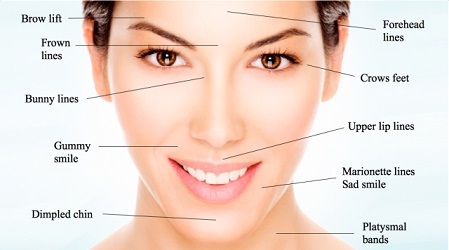 HOW IS BOTOX DIFFERENT FROM DYSPORT ? Botox and Dysport are all neuromodulator wrinkle treatments that work by relaxing the muscles that cause wrinkles. Botox is the most famous and popular non-surgical cosmetic treatment with more than 11 million people treated in the United States alone. Dysport has also been used for many years and some patients prefer the “spread” of Dysport. Some patients find that they prefer one treatment over the others. HOW MUCH DOES THIS WRINKLE TREATMENT COST? Each patient’s needs are different and therefore cost depends on the individual, but an average treatment is normally $300-$450 to get rid of frown lines. Call our office and we can schedule a consultation with our doctors at our Wellington clinic to see how much your personalised Botox treatment will cost. Most of our patients do not experience any side effects. However, as with most injectables, common side effects from Botox injections can include localized pain, tenderness, inflammation, redness, itching, bruising and/or swelling. If you do suffer from these side-effects, do not worry, they will disappear within a few days. ARE WRINKLE TREATMENT INJECTIONS SAFE? When the word “Botox®” is spoken, it’s important to understand that there are 2 different uses of botulinum toxin – one for therapeutic medical purposes and one for cosmetic purposes. The difference between the two is dosage. Botulinum Toxin can be used in higher doses to treat muscle spasms in large muscles, most commonly used as a treatment for cerebral palsy. It’s in this higher dose where the reports of complications have been reported. OnabotulinumtoxinA is the branded version of Cosmetic Botox, a very low dose of the substance used to treat fine lines and wrinkles. Botox® has an excellent safety record. It is a very well studied and safe product when used for cosmetic purposes. BOTOX® is a Prescription Medicine containing 100 units of botulinumtoxin type A for injection. Dysport® is a Prescription Medicine containing 500 units of Clostridium botulinumtoxin type A toxin haemagglutinin complex for injection. Used for the treatment of frown lines, forehead lines and crow’s feet, And for the treatment of severe primary hyperhidrosis of the axillae. They should be administered only by trained medical professionals. Talk to your specialist about the benefits/risks of this procedure. Cautions: People with defective neuro-muscular transmission disorders, infection at site of injection, glaucoma, pregnancy and lactation. Possible side effects include headaches, injection site pain, burning, stinging, bruising, swelling, redness, local muscle weakness including drooping eyelids, eyebrows, eyelid swelling, skin tightness, tingling sensations, aching or itching forehead, nausea and flu-like symptoms. For hyperhidrosis it can include perceived increase in sweating in areas other than the underarms, pain at the injection site, pain, hot flushes and transient arm weakness. If you have any side effects or concerns speak to your doctor. You will need to pay for this medicine. Normal Doctors visit fees apply. Note: BOTOX® and DYSPORT® facial treatments last about four months and after this time further courses of treatment may be necessary. Hyperhidrosis treatment lasts about 7.5 months and after this time further courses of treatment may be necessary Speak to your specialist about your own situation. BOTOX® is a registered trademark of Allergan, Inc. Allergan Australia Pty Ltd. ABN 85 000 612 831, 77 Ridge Street, Gordon, NSW 2072.